The hotel is ideally located in Paris. We are close to tourist attractions like the Centre Pompidou, the newly re-opened Picasso Museum, the Musée Grévin wax museum or the ornate Paris City Hall at Hôtel de Ville. And one of the legendary Paris theatres, Le Palais des Glaces, is a short stroll away. Business visitors can benefit from our proximity to Eurosites République, a 2,500-m2 space with meeting rooms and an auditorium just a 3-minute walk from the hotel. 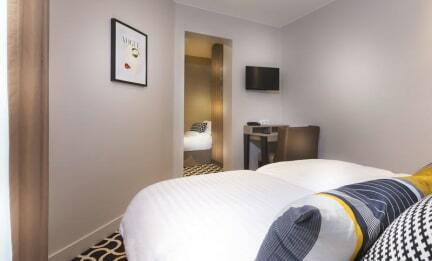 The hotel offers stylish comfortable and well-furnished private rooms for a great stay in Paris. 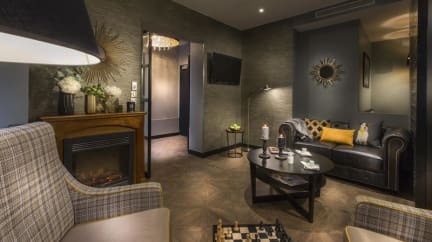 All our rooms have a private bathroom, non-smoking room, soundproofed room, Free Wi-Fi, telephone, wake up call, flat-screen TV, desk, wardrobe, hair dryer, air Conditioning and heating. Breakfast not included. Extra-cost: 13.00 euros per person per day.